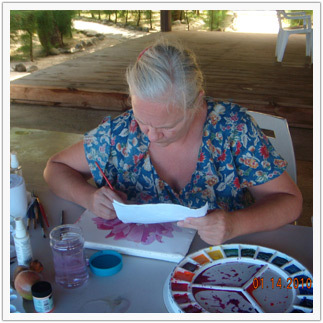 We just returned from a memorable Painting in Paradise workshop in Rarotonga in the Cook Islands, South Pacific. We all had a wonderful time. Lifetime memories and friendships were made. 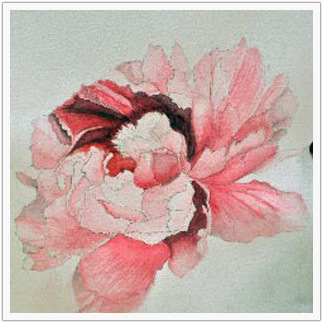 The image to the left is the demonstration painting, a camellia, that I did for the class. 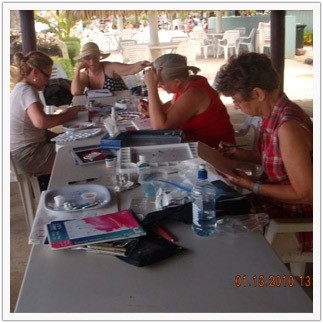 Our workshop was held just off the beach at our resort from 9:00 to 12:00 each day. Right after the workshop we all had lunch together at a different restaurant each day. Then we explored and played on the island all afternoon and evening. The ladies, busy at work on their paintings. Because we were so absorbed in the workshops, the mornings flew by fast. 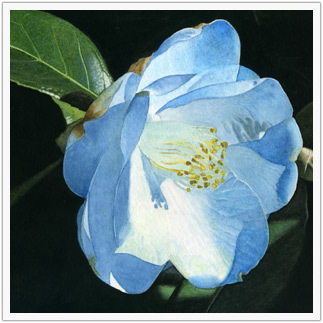 The participants worked closely with their reference photographs to capture as much realism in their paintings as possible. 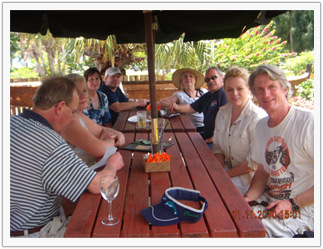 One of our afternoons after the workshop was spent on a small island in the lagoon, called Motu Taakoka. 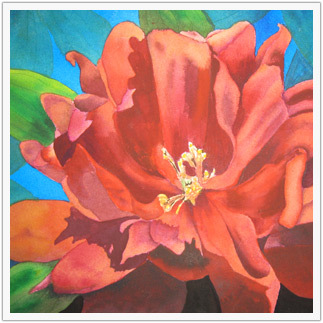 It was here that I photographed the yellow hibiscus that I painted for the main page of this site. 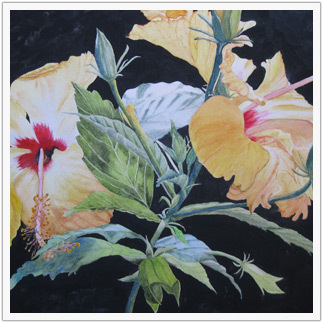 The entire west side of the island is covered with these hibiscus trees, with their beautiful splashy yellow flowers. 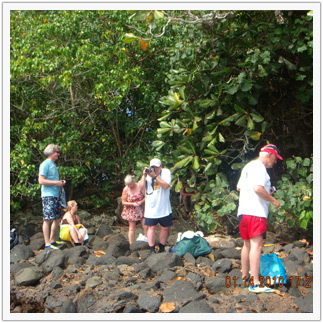 The group was amazed by the lush beauty of the island and surrounding lagoon. After photographing the tree hibiscus, we donned our snorkeling gear and explored the nearby coral reefs for the remainder of the afternoon. 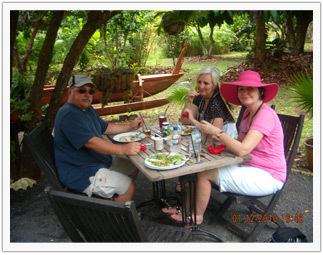 Our first meal together was lunch at the Salsa Cafe in the village of Avarua. 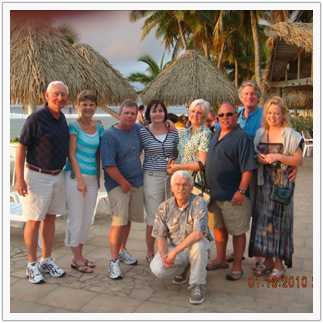 We had a delightful meal, the first of many.Then off to a huge feast, called Island Nights, at our resort. On the second day we spent most of the afternoon at Maire Nui Gardens, an expansive botanical garden with a large variety of tropical plants. We had lunch there at a delightful little cafe, then wandered around the grounds taking photographs as reference for future floral paintings. One of the fascinating discoveries that we made at Maire Nui Gardens is this amazing fruit. It’s a cashew fruit. 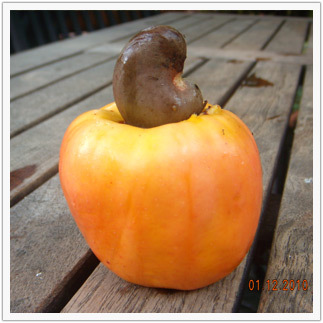 The odd-looking “stem” is actually a cashew nut. Yes, this is where cashew nuts come from. 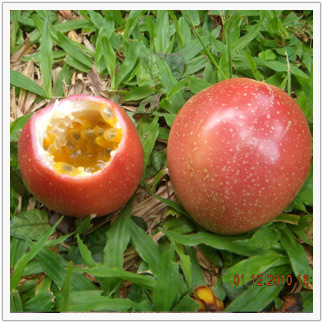 Do You Recognize This Fruit? I had never seen a passion fruit before until we were introduced to this delicious tropical fruit, lying ripe on the ground near the cafe. The groundskeeper cut a hole in the top and allowed us to sample the fruit inside. 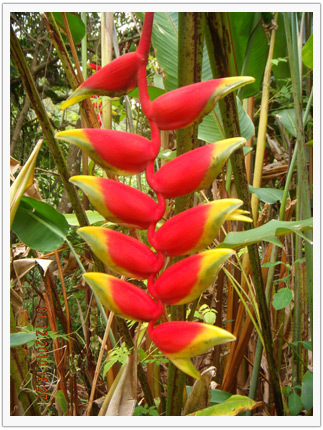 I was on a motor scooter ride up in the mountains with one of the couples in the group when we spotted this striking heliconia, or Bird of Paradise.